Due to the soil conditions in the North East, we rarely find fragments of twined textiles. Most of the cordage fragments found in northern Vermont, where found near cooper (Peterson, James B., 1996:56). A pottery shard impressed with the design of twined textile was found along the Winooski River (Power, and Petersen). Twined using the same techniques as found at the Boucher site in Northern Vermont. Currently in the traveling exhibit Alnobak: Wearing Our Heritage. This bag was made as part of a matching set. It matches the prototype of a Archaic style twined dress. It was made using the three twining styles that were found at the Boucher site. 7 1/2" x 9"
(Right) This twined textile sample is approximately 5" x 4". It was made for the Lake Champlain Maritime Museum, Vergennes, Vt. Archaic Style Sandals Prototype (left) made for the Wobanakik Heritage Center. 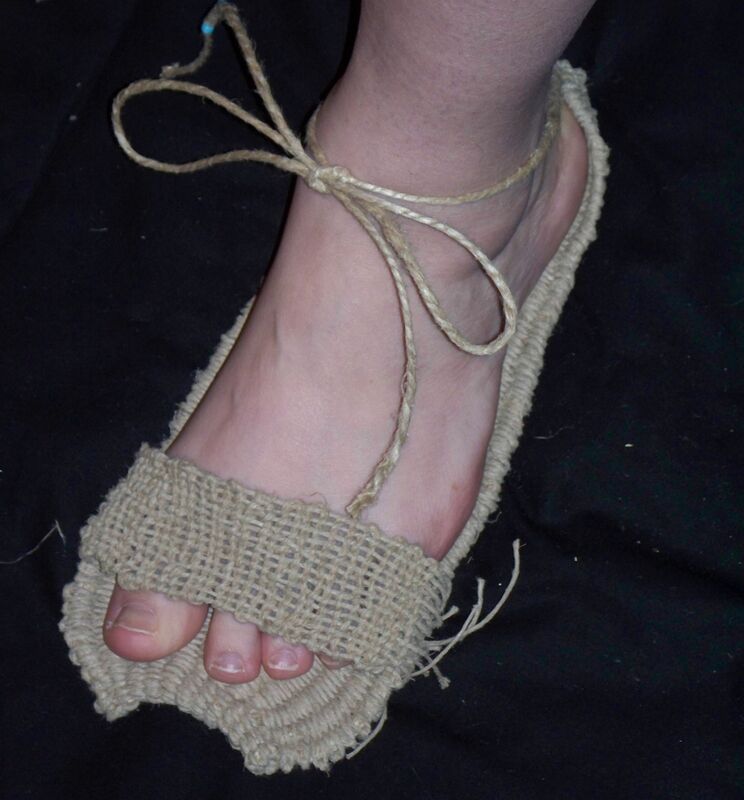 These twined sandals have been featured in "Always In Fashion: 11,000 Years of Abenaki Attire," at the Vermont Indigenous Celebration 2009 and again at the 2010 Winter Celebration, both at the Echo Lake Aquarium and Science Center. © 2011 Twined Bags & Twined Baskets By Vera Longtoe Sheehan. All rights reserved.